Roald Dahl is a beloved British writer. He is the author of some of the world's best-known children's novels, including "James and the Giant Peach," "Matilda," and "Charlie and the Chocolate Factory." More than 250 million copies of his books have been sold worldwide. His works have been translated into 58 languages. Tuesday was Roald Dahl Day. People around the world celebrated what would have been Dahl's 100th birthday. He was born on September 13, 1916 in Wales to Norwegian parents. He died in 1990. Roald Dahl Day trended worldwide on social media. 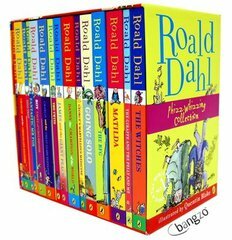 Many people thanked Dahl for making them truly enjoy reading. One Twitter user wrote, "My childhood was made magical because of the wonderful Roald Dahl. A great storyteller!" Another wrote, "You made me fall in love with reading – a love that has lasted me a lifetime." Special events and celebrations were held in Britain and other countries in honor of Dahl. The Oxford English Dictionary marked Dahl's 100th birthday by officially adding six Dahl-created words to its latest edition. They included words such as "Oompah-Loompah" and "scrumdiddlyumptious." Oompah Loompahs are the factory workers in the book "Charlie and the Chocolate Factory." They had orange skin and green hair. They danced and played music. Oompah Loompahs became more famous after the 1971 film version of the book, which starred Gene Wilder as candy maker Willy Wonka. "Scrumdiddlyumptious" is a word that appeared in Dahl's book "The BFG" – short for The Big Friendly Giant. It generally means "delicious." A film version of "The BFG," directed by Steven Spielberg, was released this year. Earlier this year, Oxford released an entire Roald Dahl dictionary. It included more than 8,000 real and invented words used by the master storyteller. He lost his beloved wife last year. But this year the focus should be on the wilds of the Norwegian countryside. The announcement marks the end of an extraordinary period in European history. She was a master of the English language. 1.His works have been translated into 58 languages. They can be translated into a clear and comprehensive set of engineering questions, similar in a way to those used in the design of a bridge or a plane. The two feedback messages in Listing 2 would normally be translated into other languages. 2.Roald Dahl Day trended worldwide on social media. Something that I think would be good for Richard to consider would be teaching how the theory of social media relates to the practice. 我认为有一些关于教学的东西是很值得理查德去思考的，比如怎样将社会媒体的理论联系实际bkQbHI3fV4BrK=[rhwz。We do not expect social media to radically change what we do.